There may be a story hiding behind the layers of cuteness and gimmickry, but anyone would be forgiven for not recognizing it as the Hans Christian Andersen tale. In this app, part of a series featuring overalls-wearing, curly-haired triplets, the sea tale is told on a stage, complete with a curtain and footlights. The framing device is clever at first—backdrops, props and characters appear as they would in a theater, dropping in and sliding by—but they're in service of a brief, unsatisfying adaptation. 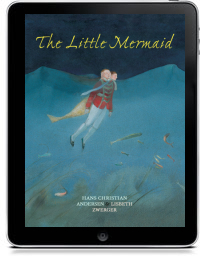 Perhaps it's a rough translation from one of the other languages the app is available in (Spanish and Catalan), but the text often reads like a set of colorless assembly directions: "But the Little Mermaid rescues the Prince. The Little Mermaid falls in love with the Prince." The ending, closer(ish) to the original tale than the Disney happily-ever-after, is wobbly and strange. After diving into the sea, the Little Mermaid is taken away by fairies and turned into "a beautiful star next to the moon." 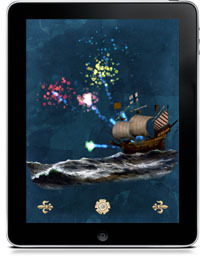 The app's most ambitious feature, "Animate your own tale," allows users to install a free version of the app on a separate device and build scenes on stage from it. Nothing about the feature is very impressive except the fuss involved in getting it going.